Our first camping trip of the year this weekend. We left home on Thursday afternoon to go to Danbury for a service and to spend Saturday at Volksworld which is being held at Sandown park, Esther in Surrey. The trip got off to a less than perfect start because I’d forgotten the tickets so we had to turn around and go home for them, adding approximately 45 minutes to the journey! We travelled to Tudor Park Camping Site near Slimbridge in Gloucestershire and arrived about 6pm. Fortunately, they’d left instructions for where to park on a board at reception as there was no one around to ask at that time of night. We had a great pitch and soon had the bed made up, etc. I chatted to an old chap who used to have an R reg van with a 1600cc engine and automatic gearbox. He’d had to swap to a more comfortable motor home for his wife but he really missed his Kombi. There is a pub next to the site which was great for getting an evening meal and a couple of pints although the bar staff hadn’t been on a charm course! Back to the van by 10pm and an early night to drive to Yate and Danbury. We were woken by the sound of waterfowl quite early in the morning – I guess e should have known really as we were next to the Canal AND Slimbridge Reserve. We left before the reception opened so we hadn’t paid for the night. I came back into the office on Monday to find a voice message asking me to ring and pay, which I did straightaway – I actually thought I’d paid when I booked but apparently not. We were at Danbury by 8.35 and bumped into the cycling lady who was there with her van when I took Absinthe down for her last service which is quite a coincidence. Maybe she’s stalking me (unlikely). After a chat to Matt, Dan and the team we took the courtesy car and Alison drove us to Bath for the day. It’s our first time there and what a beautiful place it was in the sunshine. 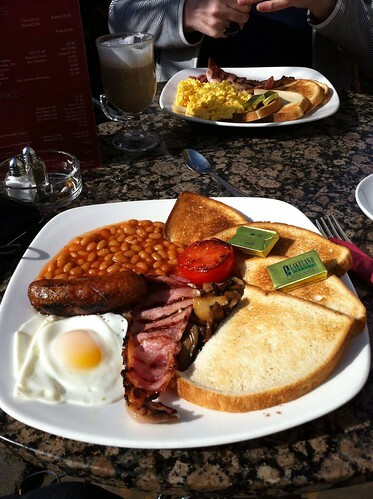 We even had breakfast on tables outside – just like Paris (I imagine, as I’ve never been). Back to Yate for 3.30pm and after a short wait we were able to pick Absinthe up. Danbury have done a great job and sorted all the issues we had – great service and an opportunity to meet Jason who I’d only ever spoken to via the Brazilian Bay Forum. We left and set off for Wellington Country Park, near Riseley in Berkshire. It was quite late when we got there but I’d rung on ahead to let them know and they’d left instructions and a key for us at the gate. They weren’t too happy though when 3 other Kombis snuck through when we opened the gate. They had to go back and pick their own keys later anyway. We had a massive pitch in the forest but I’d promised Alison that there was a pub nearby to eat and there wasn’t so I wasn’t as popular as I could have been. Fortunately, we had a couple of bottles of wine to drink but only snacks to eat. I did suggest going into the woods to kill something but after the initial excitement we decided I might be too noisy to catch anything (I’ve been on a Bushcraft weekend – I can make a trap/snare! We awoke early (again – damn that noisy pheasant) and set off for Sandown Park – the SatNav said arrival at 9.35 which was great – it wouldn’t be too busy and we could get away after lunch having seen everything. We got within half a mile of our junction for Esther when the traffic stopped due to volume of cars going through the town centre and from there it took us another 3 hours to do about 2 miles. It didn’t spoil the day though. We met some people from the Forum who were displaying their vans and ordered some new door cards from Newton Commercial at a discounted price so, all in all, a great day – oh, and the sun shone so it was like summer as well – just what we both needed. After the show we headed for Bicester and, although initially heading the wrong way on the M25 we got there whilst it was still light. We got chatting to the owner of the site who used to work on Kombis as a mechanic and explained that ours was a new one so he got quite excited and went to fetch his wife. I think they’ll probably buy one for when they retire in a couple of years’ time. Really nice people and even gave us a lift to the pub to save us the 20 minute walk! We had a lie in on Sunday morning (although as the clocks had changed it wasn’t much of one) before we drove on the B roads to Warwick. The castle is spectacular but almost none of the shops were open in town – such a waste of trade. Apparently, they are talking abut bringing Mary Portas (Queen of Shops) as a consultant. 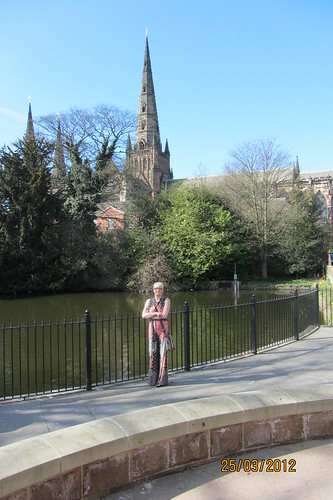 After breakfast we drove on to Lichfield and its three spired cathedral – a lovely place on a sunny day like Sunday. Finally, back to the M6 and home. A great weekend taking in probably 10 counties in all – a fantastic way to start the camping year.